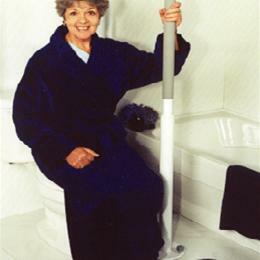 A floor mounted support pole to promote safe and independent standing and transfers. Ability to convert pole to standard Advantage Rail™ "T" handle style in future as needs change. Flexible - Perfect for applications where the ceiling height or structure will not accommodate a floor to ceiling pole. Less is more - All the transfer support and advantages a floor to ceiling pole can offer but in a compact 54” size. Rugged and Reliable - All steel construction protected with a durable baked on enamel finish for years of service. Comfortable - Premium high quality 20” rubberized foam hand grip and capped top, facilitates gripping, particularly useful for limited hand grip strength.